REDWOOD CITY Calif. and SYDNEY, June 13, 2018 /PRNewswire/ -- Equinix, Inc. (Nasdaq: EQIX), the global Interconnection and data center company, today announced the Vocus-owned Australia Singapore Cable (ASC) will be accessible in its International Business ExchangeTM (IBX®) data centers in Singapore and across six metros in Australia, including the Cable Landing Station (CLS) in Perth and points of presence (PoP) in Sydney and Melbourne already announced. Business between Australia and Singapore is increasing rapidly as Singapore's growth expands and the nation acts as a key trade, logistics and manufacturing hub for Asia.1 The ASC is the first 40Tbps subsea cable system between Asia and Australia, which will provide businesses with the capacity to handle growth in data consumption, with lower latency and cost, between the two locations. With today's announcement, ASC will add more PoPs to Equinix facilities in Singapore, Sydney, Melbourne, Canberra, Adelaide and Brisbane. Together with the CLS in Perth, the extended access will enable Equinix to meet customer demands for interconnection and networking capabilities with businesses between Australia and Southeast Asia. The ASC is a 4,600-kilometer subsea cable that will connect Singapore and Australia and is expected to be completed and operational by Q1 FY19. The new pathway from Western Australia to Southeast Asia, and additional capacity, will also serve to boost the strength of Australia's internet landscape. With direct access to ASC in Singapore and Australia, Equinix provides its customers with unparalleled connectivity to connect and expand business in Australia and Southeast Asia. Customers will be able to reap the benefits of interconnection to global markets and ecosystems through direct and private access to more than 275 cloud providers, and a multitude of service providers and business partners. Connecting in six metropolitan cities in Australia, Sydney, Melbourne, Perth, Canberra, Adelaide and Brisbane, the ASC cable will immediately leverage more than 155 networks to enable customers to do business across the region. The level of global data traffic is expected to reach 3.3 zettabytes by 20212 and almost every byte touches a subsea cable as cloud service providers, network service providers, content providers and enterprises push to move data globally in real time. Equinix continues to build momentum to meet this rapidly increasing need for subsea cables through data center design, partnerships and acquisitions. 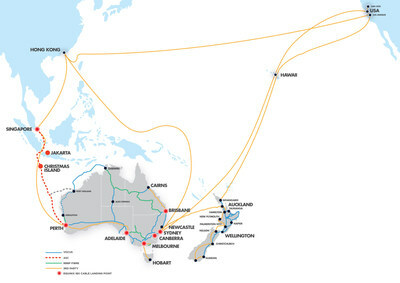 Current submarine cable projects that Equinix is engaged with and has publicly announced include: SSCN (California - Sydney); AEConnect-1 (New York - London); Hibernia Express (New York - London); C-Lion1 (Germany - Finland); Trident (Australia - Indonesia - Singapore); Globenet (Florida - Brazil); Asia Pacific Gateway (China - Hong Kong - Japan - South Korea - Malaysia - Taiwan - Thailand - Vietnam - Singapore); Hawaiki Cable (U.S. – Australia – New Zealand); Gulf Bridge International Cable System (Middle East - Europe); FASTER (U.S. West Coast - Japan); Seabras-1 (New York - Sao Paulo); Monet (Florida - Brazil), Eastern Light (Nordic region), MAREA (U.S. East Coast – Spain), BRUSA (U.S. East Coast – Brazil) and ASC (Australia – Singapore), the newest project announced today. The expanded connection of the ASC follows the Equinix completion of the Metronode acquisition, which expanded its data centers to four new markets in Perth, Canberra, Adelaide and Brisbane, and additional facilities in Sydney and Melbourne. "We are delighted that Equinix is expanding the reach and availability of the ASC cable by connecting it directly into nine of their sites across Australia and Singapore. The Vocus terrestrial network has vast reach throughout Australia, New Zealand and now into Asia. Combining the extensive interconnection ecosystems in Equinix, with the far-reaching Vocus network, we will provide customers with easy and low-cost access to all of their partners from Singapore to major metropolitan cities in Australia." "Equinix is thrilled to be able to expand our customers' access to the new ASC across each of our metropolitan areas. This will in turn provide both cost and latency advantages when doing business with organizations across Southeast Asia." Equinix, Inc. (Nasdaq: EQIX) connects the world's leading businesses to their customers, employees and partners inside the most-interconnected data centers. In 52 markets across five continents, Equinix is where companies come together to realize new opportunities and accelerate their business, IT and cloud strategies. Equinix.com.au.